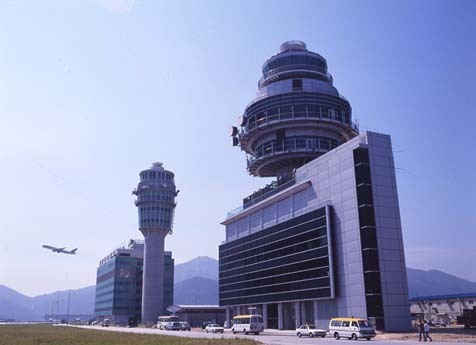 The Hong Kong International Airport passenger terminal building is 1.3 km. (0.8 miles) long and covers 550,000 sq. m. (135.9 acres). The design incorporates a Y-shaped concourse and is the world's largest single airport building. The terminal has a design capacity of 45 million passengers a year, arriving on 460 flights every day. There are 3 km (1.8 miles) of moving walkways, 55,000 m² (13.59 acres) of glass cladding and around 117,000 m² (28.9 acres) of carpeting. An average of more than 600 aircraft take off and land every day. Near 60 scheduled passenger carriers and 15 all-cargo operators link Hong Kong with more than 140 locations round the world. Other related industries at HKIA include cleaning contractors, aircraft maintenance companies, catering firms and ramp-handling operators, as well as the huge retail presence in the passenger terminal.